Diamond City! The biggest, safest, most civilized town in Boston (and seemingly the only one in walking distance in any given direction). It is surrounded by the walls of the once glorious stadium that drew people from afar to watch people smack leather balls with pieces of sandpapered wood. Here are some traveling tips for you if you were to find yourself there some day. Warning! The guards do not like to get their picture taken without consent. If you absolutely have to, wear kneepads and other protective gear. First off, the streets are paved with planks which makes the terrain a bit uneven. So watch your steps, keep looking down and halt to a stop every time you need to orient yourself or to look up at the sights. The market is situated in the middle of the city and caters to everyone’s needs. Food, water, weapons, surgery, medicines and even a barbershop if you need that backpacker-beard trimmed. The city also provides an all-faiths church, a school (if you want to raise a family here some day), a detective agency (if the family you raised gets kidnapped). Practice your japanese, ’cause that’s the only thing the cook responds to. A “yes” may work if a hot bowl of noodles is what you crave. The crime rate doesn’t seem particularly high. But there’s the occational homicide though. Found a dead guy in the barber shop. Typical mafioso-style dude. Seems like the guards doesn’t care too much about dead criminals, maybe a way of deterring crime, stating it as an example, who knows. Said it’s gonna’ be cleaned up in a while. Meanwhile, it seems I have just acquired a new gun. Bet this guy won’t miss it. Very few here wants to compromise their position in this city by partaking in criminal activity. At any sign of sinister behaviour, they’ll be kicked out, so better stay on the safe side. There’s not much interesting to read anywhere in the city, and for those who need to learn basic reading and writing, there’s the school to teach them that. No advanced stuff though. In terms of wealth inequality, everyone is so dirt poor that the difference between rich and poor is more of an attitude thing and litteraly a handfull of caps, not more than that. Drug or alcohol addictions? Everyone has one, or several. This means either everyone goes to jail or no one. Actually there’s no official jails here, so don’t ever worry about going to one. Self policing is a keyword. If you steal something, the risk of getting shot is so high that people tend not do anything that.. well.. get’s them shot. And usually the one shooting the thief is also getting shot because of a misinterpretation of the situation by the guards. Stay on the safe side. Not sure if this guy was dead or just drunk. Smelled dead, or just very, very drunk. This place has a bustling nightlife. I know, as I spent quite some time at the local hangouts, the Colonial Taphouse and the Dugout Inn. Great establishments. Good prices. The Colonial Taphouse is for the more distinguished people, which in relative terms means they have a nicer shirt, with no more than a few holes in them. It’s situated in the finer part of town, a couple of stairs above the rest of the city. A bit further away, one finds a personal “elevator” up to the mayors office, which is through the window of the VIP-lounge in the stadium (lol, this is just too good). Dugout Inn. A bar for the more proletariat-type of crowd, if there’s even a distinction between ‘dirt poor’, ‘barely making’ it and ‘even poorer’ in these lands. Let’s call Dougut Inn the down-to-earth bar and Colonial Taphouse the stiff-upper-lip bar. Most people’s idle time is spent here. Problems are forgotten and arguments solved, like any other less than reputable bar. The place is run by the Bobrov brothers Vadim and Yefim. They offer a signature drink distilled by them personally at the bar. Bobrov’s Best Moonshine is it’s name. So strong it makes you forget you were even there. If you decide to have a bottle of it, you may as well take advantage of their reasonably priced rooms for rent. 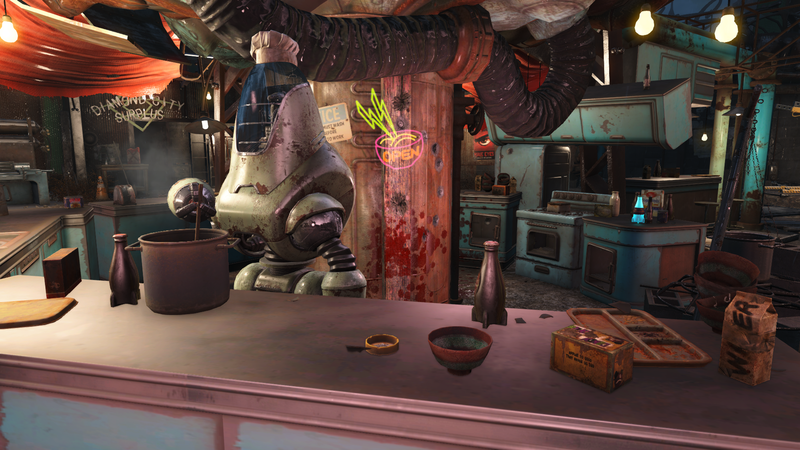 So, whether you are in need of supplies, looking for some excitement or just want a place to stay for the night, Diamond City is the place to go. The only place, according to some, since the wasteland is just that. A wasteland. That’s all for now. See you in Diamond City, folks!